Wednesday April 23rd 1879 I felt some better today and worked with the carpet rags some besides doing some knitting. Hatt and Lee went to Riverside for flour. Thursday April 24th 1879 I felt better today and wound the carpet rags in skeins to color them and knit a little in the evening. This is Charlies birthday. 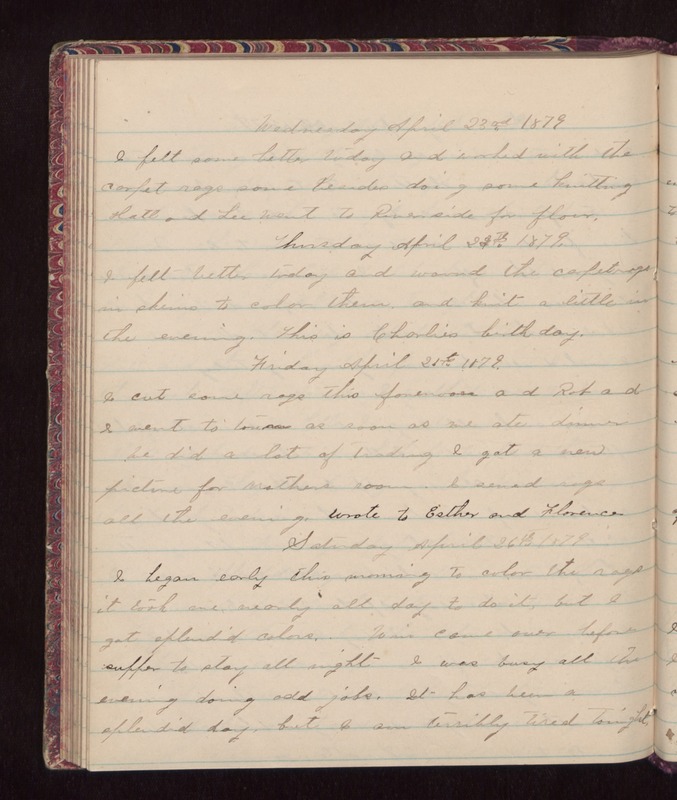 Friday April 25th 1879 I cut some rags this forenoon and Rob and I went to town as soon as we ate dinner. He did a lot of trading. I got a new picture for Mothers room. I sewed rags all the evening. Wrote to Esther and Florence. Saturday April 26th 1879 I began early the morning to color the rags it took me nearly all day to do it, but I got splendid colors. Win came over before supper to stay all night. I was busy all the evening doing odd jobs. It has been a splendid day, but I am terribly tired tonight.